You might have suddenly noticed a sore spot in your mouth. Perhaps you feel a lump on the inside of your cheek that seems to have grown over the last few months. 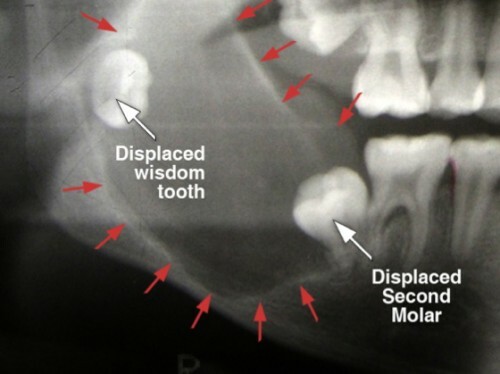 Or on your last dental X-rays your dentist noted a dark area around your impacted wisdom tooth resembling a cyst. Perhaps during your cleaning, your dentist noticed a white area, pigmented spot, or an ulcer in your mouth that was not there before. Oral lesions can occur at any age and virtually any where in the mouth, including tongue, cheeks, roof of mouth, floor of mouth, gum tissues, and jaw bone. The majority are benign but occasionally may be more aggressive or even malignant. Early detection, evaluation, and treatment are important in its management. Different types of oral pathological conditions include cysts, masses, ulcerations, or lesions. The condition may be benign commonly presenting as a slow growing, well-defined, and painless lesions. On the other hand, malignant lesions grow rapidly, are often painful, and have broad and irregular borders. Any abnormality must be evaluated and treated as soon as possible by an oral surgeon. A biopsy is generally indicated for any abnormal condition which has not resolve spontaneously in 7-10 days. Cysts are empty spaces or cavities in the jaw bone with a thin lining and fluid inside. Cysts may occur in upper or lower jaws. The majority of cysts of benign and are associated with teeth, referred to as odontogenic cysts. Anxiety is not uncommon among people with oral lesions requiring biopsies or while awaiting for the definitive diagnosis by the oral pathologist. We’ll try our best to answer your questions and provide you with information as soon as available to help put your mind at ease. Anxiety with oral surgery in general is mostly related to hearing of others’ bad experiences with excessive pain, swelling, and complications. We resolve this in several ways. First, the use of IV sedation allows patients to nap during the surgery. This helps greatly to make them comfortable and reduce anxiety. Second, patients will be cared for by a group of affable staff members who take time to personally connect with each patient and allay their fears and concerns. Third, the surgery is done conservatively, which minimizes or avoids swelling, pain, and complications. The cost for surgery depends on the type of lesion, its size, location, procedure, and type of anesthesia. Once you have been examined and treatment plan completed, the exact cost will be discussed.